One of the finest hotels on the Costa Smeralda and a member of the prestigious brand Small Luxury Hotels of the World. Grand Hotel Poltu Quatu nestles splendidly within this pretty little port made up of all-white buildings which dazzle in contrast to the vibrant bougainvilleas, crystal clear waters and pristine yachts which line the windy path of its natural fjord. Poltu Quatu was built to resemble an ancient fishing village and despite being small and a relatively new development, it blends perfectly within its natural environment, creating a picture postcard dream. Backed by pink granite mountains this idyllic oasis is one of the most desirable locations on the Costa Smeralda while the Grand Hotel offers everything expected of a luxury resort. 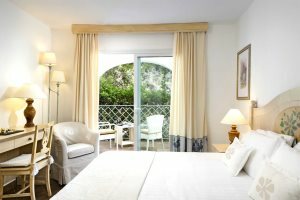 In elegant Spanish-Sardinian style its 146 rooms offer maximum comfort and privacy with balcony views towards the mountains, pool area or harbour and islands beyond the fjord. The hotel has three excellent restaurants, a café and piano bar which offer an intimate atmosphere to relax and unwind with an extensive selection of local, national and international specialties and fine wines to choose from. The marina/harbour is an excellent starting point for boat trips and there are many to choose from including excursions to the beautiful archipelago of La Maddalena. It’s also a good centre for diving with many schools using the port as their base and just about any boating activity can be arranged. There are a small number of shops and bars to choose from while the bustling glitz of Porto Cervo is within a 5km drive and the famed beaches of Liscia di Vacca are even closer. This is a perfect choice for couples seeking a romantic holiday in an exclusive location within the Costa Smeralda. Swimming pool, restaurants, pool café, piano bar, beauty and fitness centre, sauna, tennis courts, diving centre, golf and rental services (cars, yacht, helicopters, private excursions, guided tours). En-suite facilities, household linen and amenities, Wi-Fi, air-conditioning, satellite television, minibar, safe, hairdryer and balcony. 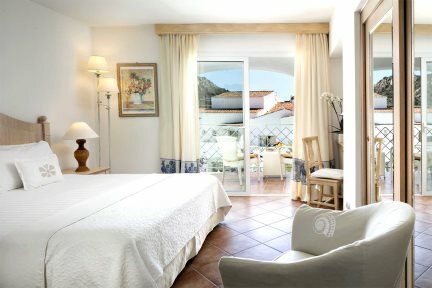 Classic rooms (18m2) are furnished with terracotta-tiled floors and decorated in a modern design. With a double bed or twin beds, all rooms have an marble en-suite room with shower or bath, and a private balcony. 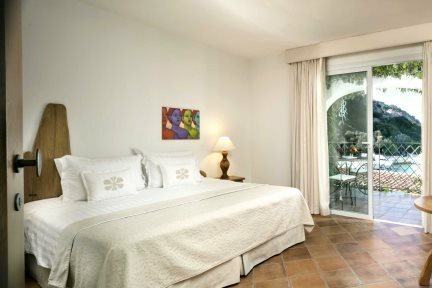 Superior rooms (20m2) are elegantly furnished with terracotta-tiled floors and decorated in a modern design offering the perfect balance between comfort and elegance. With a double bed or twin beds, all rooms have a spacious en-suite room with shower or bath, and a private balcony. Deluxe rooms (20m2) are furnished with pastel fade fittings and decorations in harmony with the environment and the cosy atmosphere. Superior Rooms have a double bed, a private large marble bathroom, and a private balcony which overlooks the enchanting harbour. Overlooking the beautiful Marina dell'Orso, Classic Suites (50m2) boast terracotta-tiled floors, decorations inspired by the tradition of the Sardinian art. These suites have a double bedroom, a spacious marble en-suite bathroom. Poltu Quatu was built to resemble an ancient fishing village and despite being small and a relatively new development, it blends perfectly within its natural environment, creating a picture postcard dream. Situated between the lively resorts of Baia Sardinia and Porto Cervo, there is a wide variety of shops, bars and restaurants within a short drive of the hotel. Phi Beach at Baia Sardinia is perhaps one of the trendiest places in Sardinia to watch the sun go down with a pre-dinner drink, whilst Porto Cervo is home to some of the best restaurants on the Island.